Esther Klok, a veterinary technician at Dierenkliniek Winsum in the Netherlands, described her passion for bringing new ideas back from the NAVC Conference to her clinic in “What Moves You? From Holland: Looking Back on a GREAT Adventure” (Today’s Veterinary Nurse May/June 2016). In this article, she discusses her inspiration to initiate veterinary technician appointments, as well as how she introduced and implemented her plan. What inspired your idea to establish veterinary technician appointments, and why did you follow through with it? After a long day of listening to presentations at the NAVC Conference in Orlando, in a language other than my own, I was lying on the bed in my hotel room, thinking about how I, a young vet tech, had ended up in the United States, far from home. This was an amazing country that I had seen often on television. All the movies and television series I watched were from here too, so I felt like I knew quite a bit about the American way of life. Now I was here! The conference was so big and had so many people and lectures. It also had so many new ideas. I had listened to lectures about animal weight, behavior, and dentristy, and had learned about puppies and their problems, public relations and marketing for veterinary clinics, pet diets, and much more. Also, I talked with a number of veterinarians and heard them describe how their veterinary technicians took so much work off their hands. That was the moment I began to think about the idea of vet tech appointments. They would keep clients in our practice, get some work off the vets’ “plate,” and do something good for the animals. That’s exactly what our job is all about. Most importantly, it involved what I love to do! TEACH CLIENTS AND CHILDREN the correct schedule for applying flea control products. Let children help you with a demonstration. For example, for a spot-on product, have the child hold some food very low so that the pet has to bend its head to eat. You—or the client—can then easily apply the product. Children love to do this, and they will help remind their parents of the schedule. How did you approach your boss with this concept? On the plane ride home, I was thinking of a way to introduce my ideas to my colleagues and boss. I did not want to scare them with too many big ideas. I am a really busy, enthusiastic person, and often, my biggest problems are that I am too busy and too enthusiastic! But then, at a staff meeting, my boss told us we all must create a plan that would benefit the practice. None of the vet techs knew what to do, so I asked them if they wanted to help me with a big plan we could all take part in. Needless to say, they loved this joint plan. Also, I have the best boss! He always listens to ideas and gives opportunities to try new things. More importantly, he lets people make their own mistakes and learn from them. Not everything you try will work out perfectly, but you can only improve yourself when you can make your own decisions and mistakes. How did you choose what practice areas were best for vet tech appointments? The areas a practice chooses to focus on for vet tech appointments should be areas the whole team is comfortable with, and that’s why it’s important to talk to the whole team about it. ENCOURAGE CLIENTS TO BRING THEIR CHILDREN with them to veterinary technician appointments. The children will learn a lot, and the owner can, too. You can examine the pet with the owner to show them what is normal (or not), so they can learn what they can check at home, like teeth, haircoat, and skin. Here, a child watches as his puppy’s teeth are checked. 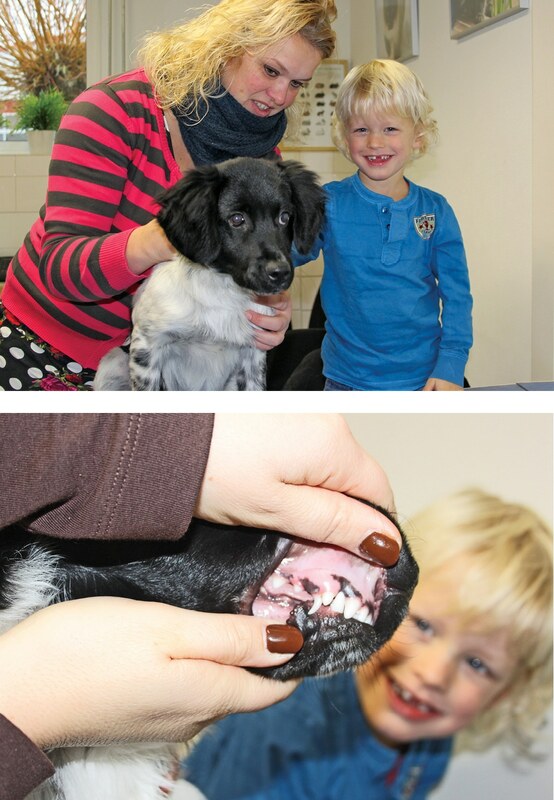 The puppy has a double fang…while the boy is missing some teeth! We decided these should be the subjects we should build our program on because (1) people want this information from us, and (2) we knew a great deal about it and were accustomed to talking about it. Did you have any resistance from your colleagues? If so, how did you overcome it? Before you create a new plan, think about what people in the team love to do. People will be resistant when they are afraid they cannot do something. So, one should try to create a plan that makes everyone comfortable. I knew the skills of our team and what they loved, and I tried to make a plan where everybody was in the saddle of the right horse. For example, I knew that one of my colleagues hates to create new programs, but she is the best receptionist because she knows the clients and animals by name, knows about their lives, and has a really special bond with most of them. So we decided she should be the one to inform them of our new service. My computer skills are subpar, so another colleague did the computer work and designed the flyer to give away at the front desk. And one of the vets really loved this idea, so she took on the task of convincing the other vets of the benefits of the program. The plan we presented was that the animals would be scheduled to come in more frequently, sometimes about 10 times a year, so they would get used to being spoiled in our practice, get more accustomed to being loved on the table, and feel fear free with all the staff. Nothing “bad” was scheduled during these appointments—only TLC. 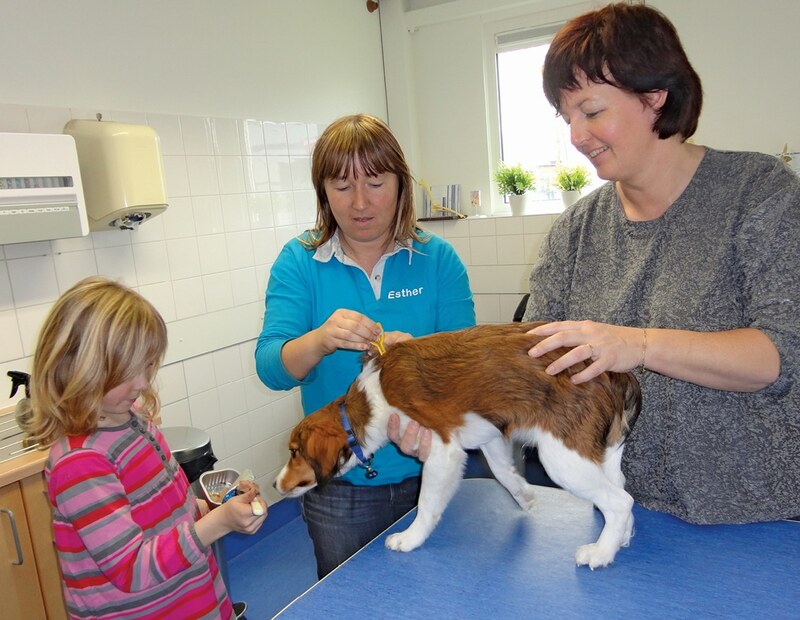 The idea was, when owners saw that their animals were happy in the clinic, they would begin to come more often and enjoy visiting the practice. So, in addition to everybody on the team having a task they loved, the little problems that came up were solved in no time, because everyone wanted to start doing it. I understand. But when you want to make your work more interesting, and you want a practice with more income, take the chance! When a new plan such as providing vet tech appointments is working well, you can hire an extra vet tech, because the appointments will bring more clients into the practice, providing more work and more money. I also hear about space problems. But where there is a will, there is a way! When we were renovating our practice, I had to do the vet tech appointments in the quarantine area. I was afraid of what the owners would think of this, but they were so happy that we made an effort to enable them to come to appointments that we even received boxes of chocolate as a token of appreciation. Don’t look for problems; always look for solutions. Owners will see this and put more trust in you and your team. When you implement new things in your practice, you are developing the practice, the team, and all the individual team members. PUPPIES AND KITTENS can come to the clinic just to be adored. Let them explore and get comfortable with the space. Owners love it when you let their pets do a little “sightseeing,” and you can watch the animal move to see if its gait and balance are normal. Treats help pets relax and teach them that the clinic is a pleasant place to be. In my clinic, we always have a supply of Kongs filled with meat paste in the freezer. How did you initially set up the vet tech appointments? We started by offering vet tech appointments in the evening, after our normal closing time of 6 pm. This way, we did not have to hire an extra vet tech to start the program. Instead, I scheduled appointments after my normal working hours. It was also a great way to start because many people are free from their jobs in the evening and have time to come. The only issue was that there were no vets in the building after 6 pm, but I could always make a phone call when I needed to consult with them. This further developed trust between me and my boss, because he knew I would not do things that a vet tech is not allowed to do. After a few months, the clients, my colleagues, and my boss were so enthusiastic that my boss asked me to start scheduling appointments on Wednesday afternoons. We were also able to hire an extra vet tech to take my place on Wednesday in the operating room. Time is important, because I let all the animals walk freely so I can observe how they move and behave. Even more importantly, I take time to listen to the owners and then give advice. Vet tech appointments are free for clients who buy food, get vaccinations, or purchase medicines from our practice (regular customers), and for all puppies and kittens every month until they are adults. For other customers, we charge about 30 euros (a little over $30). Soon we noticed we were selling more deworming and flea control products, food, radiographs, spay/neuter procedures, and dental services because of the vet tech appointments. More importantly, we were building stronger relationships with clients because they came in so many times. Our clients were less inclined to go to the supermarket to buy food or to change veterinarians. When puppies come in from a young age (every month for about 10 months), they love you for life. Even years later, they come running into your practice. They are not afraid because they trust you and feel relaxed at your practice. That is worth so much, even if it is not directly measurable! It’s important that every visit be a party for the pet, which also makes it a party for the owner. Having a relaxed animal is your first priority. Besides, who can give more TLC than a vet tech? Here’s a good tip for initiating your first vet tech appointment: Start by seeing puppies and kittens. People love these appointments, and you will feel really good about yourself and your team after the first day! It will give you the self-confidence you need to move on to areas like dental checks and overweight appointments. How do you “sell” veterinary technician appointments to clients? Every member of the team must provide information about the appointments to owners! Our whole team is proud of our program, so this is not a problem for us. Give people flyers with all the information. Try to schedule appointments immediately. Reach out to newspapers and radio and television stations to promote your clinic. The press loves covering subjects like happy puppies and “before and after” pictures of dogs losing weight. How has the client response been? What, if any, obstacles might someone have to overcome to initiate a program like this? Clients love these types of programs and tell others about them. So the only obstacle is…you. First, you need to be positive. If you have a negative attitude, owners will feel it immediately. Of course, there will always be challenges to overcome. Once, half our staff had the flu and we did not have enough people to handle our 10 vet tech appointments, forcing us to cancel them at the last minute. But the same thing can affect a practice’s surgical or walk-in vet appointments. That’s not a problem with the program, it’s just life. Also, you will always have difficult owners. Just talk to a colleague about it, share the frustration, and help each other when necessary. Is the program a success at your practice, and what, if anything, would make you “give up” on this idea? In a couple ways, it is easy to measure the results of the program. For one, we simply look at what we sell to the clients who come for these appointments. For another, the appointments have been very satisifying for my boss, and because of his enthusiasm and support, we now have 2 days of vet tech appointments. Other results are harder to measure. Have we kept clients loyal to our practice with this program? We can’t be sure. But we do see happy pets and owners, and a good relationship is so important! What’s perhaps most important for me is that it adds value to my job to have my own appointments, and it gives so much satisfaction! Helping animals become fear free, giving owners a great experience, and seeing the health benefits make it worth it. When animals run straight from the car to the appointment room, when I am almost hugged to death, when an owner loves to come in every month, when a frightened animal becomes fear free, when a dog that almost couldn’t walk because of its weight loses so many kilos that he can run around, or when a cat can wash herself again after losing 2 kilos of fat—I feel like Superwoman! It gives me energy to do this job even after 22 years. It’s why I’m a vet tech!